Gibson Jumbo Model Flat Top Acoustic Guitar (1934), made in Kalamazoo, Michigan, serial # 1496-21 (FON), sunburst lacquer finish, mahogany back, sides and neck; Sprice top, rosewood fingerboard, original black hard shell case. One of the rarest, most historic -- and just coolest -- of all Gibson acoustic guitars, the "Jumbo" was the Kalamazoo company's first 16", round-shoulder Dreadnought-sized flat-top Spanish guitar. This powerful-sounding, big-bodied instrument was the progenitor of many generations of all the round shouldered "J" models that have since become some of the world's favorite guitars. Introduced in 1934 at a price of $60.00, the Jumbo was very short lived; within a little over 2 years, the model had been split into two different guitars: the cheaper, bare-bones J-35 at $35.00, and the fancy rosewood Advanced Jumbo at $80.00. The many round shoulder Gibsons since -- the J-45, SJ, J-50 -- and the like are all direct descendants of this model. 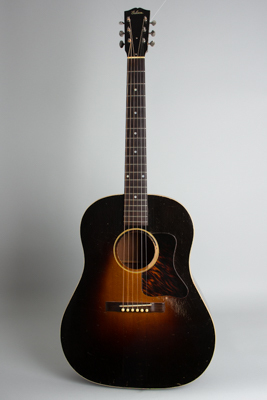 This original 1934 Jumbo is typical of the early versions of the model with an unbound fingerboard, dark top with a very small sunburst area, and riveted-gear Grover tuners. Other specific "Jumbo" features are the pearl Gibson headstock logo, big wide neck, and sunburst finished areas on the back, sides, and even the neck. The neck itself has a substantial "V" contour but is fairly shallow back to front. This guitar has a FON (Factory Order Number) dating to late 1934, and has not seen a whole lot of play since then. We consider this guitar to be simply one of the great experiences of flat-top playing and collecting, and a truly wonderful-sounding instrument! In the mid-1930s before Bill Monroe led a full band of bluegrass boys, he and his brother Charlie had a great deal of success as a radio and recording duo act called "The Monroe Brothers". They cut a number of sides for Bluebird records that are considered among the best duet discs of the 1930s and introduced a number of songs that would become bluegrass and country staples in the years to come. On all, or nearly all, of those recorded, Charlie played a Gibson Jumbo just like this one, while Bill played a Gibson F-7 mandolin. They were even pictured in the Gibson catalog as endorsers, posing for posterity with their set of (for then) expensive Gibsons. Overall length is 40 3/4 in. (103.5 cm. ), 16 1/8 in. (41 cm.) wide at lower bout, and 4 1/2 in. (11.4 cm.) in depth at side, taken at the end block. Scale length is 24 11/16 in. (627 mm.). Width of nut is 1 13/16 in. (46 mm.). Overall, this guitar has some play wear and repair, but remains the cleanest and most original of these very rare guitars we have seen. The original dark sunburst finish has some minor scrapes and dings, but has very little fade and only light checking. The only major area of loss is on the sound hole edge just above the pickguard, where there is some pick wear down into the wood. There are some repairs; the bridge is a expert pro replacement, as is the (exact repro) bridgeplate. There are two long cleated top grain cracks behind the bridge; each runs from beneath one of the E strings to the edge of the guitar. There was a tailpiece mounted at some point, and there are tiny filled and touched up holes on the rim attesting to that. A small piece (about 3/4") of the sound hole edge below the fingerboard has been very cleanly replaced; this is only noticeable on close inspection, as it is a very neat job. The neck angle is excellent and has never been reset. This is an absolutely fabulous-sounding guitar -- powerful, resonant, and with exceptional projection. It also includes the original flat-bottom hard shell case, which is even rarer than the guitar! Overall Excellent Condition.